Though DJI might be most famous for its drones, the company is making significant efforts to set itself up as a major player in the wider photo and video industries as well. 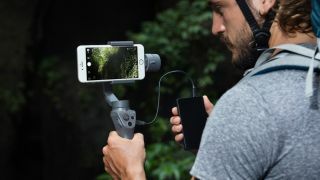 To that end, we saw two new products arrive yesterday: the Ronin-S, a one-handed stabiliser for DSLR and mirrorless cameras, and the Osmo Mobile 2, an updated smartphone gimbal. Let’s take a closer look at each product in turn. The Ronin-S is available in two sizes, one for DSLRs and the other for mirrorless cameras. It packs a three-axis gimbal that uses high-torque motors designed to support DSLR and mirrorless systems that are popular with video shooters. So, those, in the Canon EOS 5D and Panasonic Lumix GH lines, for example, together with Sony's Alpha models. The stabilisation system is designed to work in tandem with existing in-camera and in-lens systems. Furthermore, DJI also claims that it can compensate for the high magnification ratios of zoom lenses. The Ronin-S is designed for quick setup, with axis locks to speed up the process and a new Push mode that allows for quick hand adjustments of the pan and tilt axes. It features dedicated control buttons that allow users to toggle between SmoothTrack settings among other things, while its intelligent battery technology allows for hot-swapping – useful for extended shoots. Using the DJI Ronin mobile app, users can set up complex camera moves such as Panorama or Hyperlapse, making use of DJI’s SmoothTrack technology. These settings can also be customised to the user’s preference. The DJI Ronin-S is expected in a later quarter of 2018 but pricing is yet to be confirmed. In the meantime, you can find out more at DJI’s website. This smartphone camera stabiliser is not just an update to the original Osmo Mobile – it’s a significant refinement of the original concept, with two key changes. One of these concerns the camera's battery, which is now a built-in cell rather than an interchangeable one, with enough juice for up to 15 hours of filming. The other is price; the Osmo 2 will retail at $129/£139, which is significantly cheaper than the $299 commanded by the original Osmo upon its release. DJI doesn't seem to have sacrificed any functionality to achieve this new price point, however. The new Osmo Mobile 2 is said to offer more controllable movement than its predecessor on every axis, and its new spring-loaded mount promises to make it much easier to snap your phone in and out. It also supports shooting in portrait orientation, and boasts a new USB port that allows the phone to charge off of its internal battery. The Osmo Mobile 2 packs plenty other useful features, such as ActiveTrack, Hyperlapse and Motion Timelapse, while photographers can also enjoy Panorama, Long Exposure and LightTrail modes. Additionally, a new zoom slider can also be used to replicate filmic techniques such as a dolly zoom.